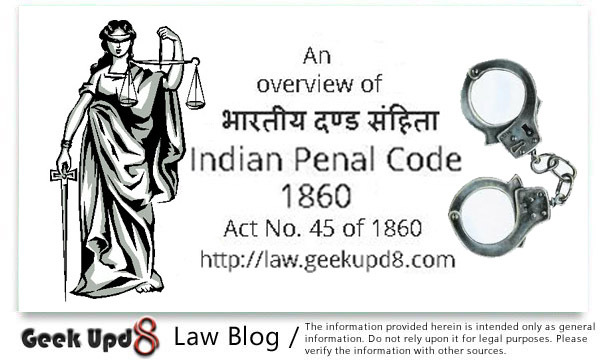 Indian Penal Code (IPC, Hindi: भारतीय दण्ड संहिता) is the main criminal code of India. It was drafted in 1860. In the state of Jammu and Kashmir, the IPC is known as Ranbir Penal Code (RPC). After independence, Indian Penal Code was inherited by Pakistan (now called Pakistan Penal Code) and Bangladesh, formerly part of British India. It was also adopted wholesale by the British colonial authorities in Burma, Sri Lanka, Malaysia, Singapore and Brunei, and remains the basis of the criminal codes in those countries ~ Wikipedia. The Indian Penal Code has been extended to Berar by the Berar Laws Act, 1941 (4 of 1941) and has been declared in force in- Sonthal Parganas, by the Sonthal Parganas Settlement Regulation, 1872 (3 of 1872), Section 2; Panth Piploda Laws Regulation, 1929 (1 of 1929), Section 2 and Sch. ; Khondmals District, by the Khondmals Laws Regulation, 1936 (4 of 1936), Section 3 and Sch. ; and Angul Distict by the Angul Laws Regulation, 1936 (5 of 1936), Section 3 and Sch. It has been declared under Section 3(a) of the Scheduled Districts Act, 1874 (14 of 1874), to be force in the following Scheduled Districts, namely: the United Provinces Tarai Districts, see Gazette of India, 1876, Pt.I, p.505; the Districts of Hazaribagh, Lohardaga (now called the Ranchi District, see clacutta Gazette, 1899, Pt.I, pl44) and Manbhum and Pargana; Dhalbhum and the Kolhan in the District of Singhbhum, see Gazette of India, 1881, Pt.I, p.504. It has been extended under Section 5 of the same Act to the Lushai Hills, see Gazette of India, 1898, Pt.II, p.345. The Act has been extended to Goa, Daman and Diu by Regn. 12 of 1962, Section 3 and Sch. ; to Dadra and Nagar Haveli by Regn. 6 of 1963, Section 2 and sch.I; to Pondicherry by Regn.7 of 1963, Section 3 and Sch.I and to Laccadive, Minicoya dn Amindivi Islands by Regn. 8 of 1965, Section 3 and Sch. It has been extended to the State of Sikkim w.e.f. 13.9.1994 vide Notification No. S.O. 516 (E), dated 9th July, 1994. Here you can download IPC 1860 pdf version. This file has been sourced from internet, you may verify with other sources. You can buy IPC 1860 in Hindi (Bhartiya Dand Sanhita, 1860) book from ebcwebstore.com. 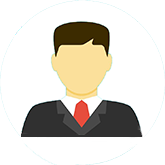 You can transfer it to your phone, tablet or any pdf supporting gadget for reading. 949 KB pdf file, Adobe Reader required.